The results of a simple but extremely accurate midterm election forecasting model indicate that the 2014 U.S. House elections are likely to result in minimal change in the party balance of power. The forecasting model uses three predictors — the current party balance of power in the House, the results of the last presidential election and the relative standing of the two parties on the generic ballot question, a national poll that asks voters which party they prefer in their local House race. Estimates for the model are shown below based on all 17 midterm elections since the end of World War II. The party holding the White House almost always loses House seats in midterm elections. However, the size of those losses varies considerably, and one key factor is how many seats the president’s party is defending. These results indicate that Democratic losses are likely to be limited in 2014 due to the fact that Democrats are defending only 201 seats this year. As a result, Republican pickup opportunities are likely to be limited. Another regular feature of midterm elections is that the bigger the winning margin for the president two years earlier, the more seats his party is likely to lose in the midterm election. That is due to the removal of presidential coattails in the midterm election. In this case, however, the effect is likely to be small because President Obama’s margin of victory in 2012 was only four percentage points. Obama’s coattails were very short, so Democrats mostly won’t miss their presence in 2014. Finally, the results of the generic ballot have a significant influence on House seat swing. The better the performance of Republicans on the generic ballot in early September, the more seats Republicans are likely to gain in November. For every one point of additional margin on the generic ballot, a party can expect to win about 1.7 additional House seats. Thus, a 10-point generic ballot margin would be worth roughly 17 additional House seats. The generic ballot results do not accurately predict seat swing until the summer and early fall of the election year. 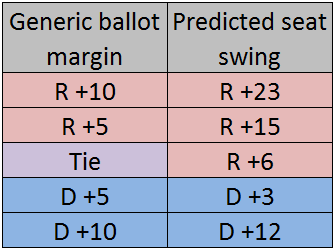 However, based on the number of seats currently held by each party in the House and the results of the 2012 presidential election, we can calculate the expected seat swing in November depending on where the parties stand on the generic ballot in early September. Those results are shown in the following table. In recent weeks, the generic ballot has shown results ranging from a Democratic lead of around six to seven points to a Republican lead of two to three points. According to the HuffPost Pollster polling average, the most recent results show a small Democratic advantage. Based on these results, the most likely outcome of the 2014 midterm election appears to be a very small gain for Republicans, although a similarly small gain for Democrats cannot be ruled out. Democrats would need a very substantial lead on the pre-election generic ballot surveys, something in the vicinity of 12 to 14 points, to have a good chance of gaining the 17 House seats needed to regain control of the chamber. At this point, that appears highly unlikely — no nonpartisan poll in the past year has shown a double-digit Democratic lead on the generic ballot. Moreover, no party holding the White House has gained anywhere near 17 seats in a midterm election in the past century. It seems highly unlikely that 2014 will see such a result. On the other hand, it also appears highly unlikely that Republicans will be able to significantly increase the size of their House majority in November. Right now, the most likely outcome of the House elections would appear to be a near standoff. Of course, the results of statistical forecasting models are subject to a margin of error. In the case of this model, the average prediction error over the last 17 midterm elections has been around 10 seats. More precise predictions of House seat swing will require information about individual House contests, and for that the reader will have to consult the Crystal Ball’s regular House election updates.